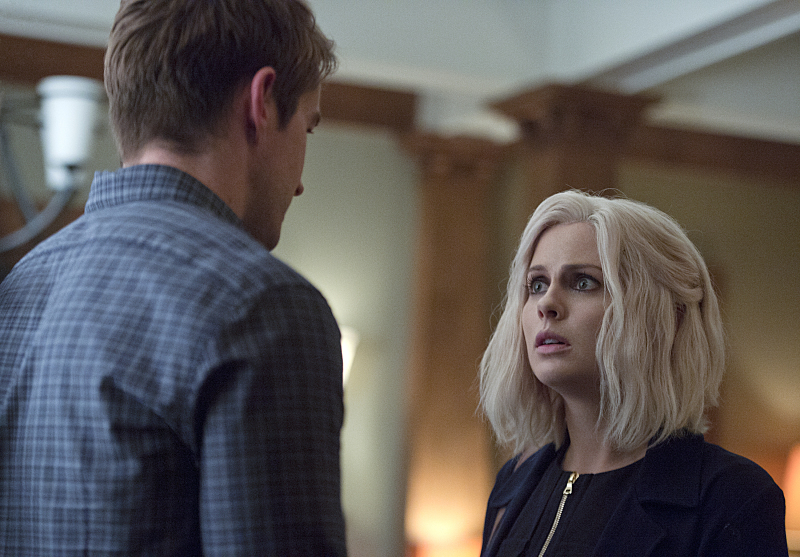 The Liv alter ego that we get to see in this week's iZombie is basketball coach Liv. And although most of the sports jokes and references flew right over my head, it was still entertaining to watch how dedicated and supportive she was, particularly in her relationship with Major. As usual, though, I did enjoy the scenes where Liv was being her normal self. I appreciated that the beginning of the episode picked up right where the last one ended — with the aftermath of Major and Liv's kiss. It's in these moments that we get a taste of what they were like as a couple before Liv turned into a zombie. They were playful and flirtatious, as if no time had passed at all. And they were happy in each other's company... until Liv realized that it may not be too wise for them to be kissing. If Major has any open sores in his mouth, her zombie-ness could be transmitted through those. So to be safe, they decide to remain friends until there is a solid cure available. Even as friends, they're an incredibly cute pair. The morning after their kiss, Liv checks Major's vitals to make sure that he isn't turning into a zombie and they even co-coach a kids' basketball team together later in the episode. Throughout all of this, though, Major gazes at Liv with major (slight pun intended) heart eyes. "I want us to be together again. I know all the risks and all the reasons it can't work, but I don't care. I'm a better man with you in my life." That last sentence refers to a much needed pep talk Liv gave Major about his Utopium addiction. We've recently only been seeing brains that influence Liv's personality for the worse, but this is definitely one of the better moments she's had while under the influence of them. "I fell in love with the guy who could've cashed in on his looks, his connections, his notoriety. But instead, he said, 'I've been blessed and I want to give back. I'm gonna be a social worker. I'm gonna be the guy who helps others get back up.' I know that this time it's harder to get back up than it's ever been, but you're Major MotherFlippin' Lilywhite and you don't quit." It's this speech that seems to revitalize the old Major. You can see it on his face. Her words inspire him and they do make him a better person. So Major cleans up his act and makes changes for the better. He throws away his last bit of Utopium, starts coaching a kids' basketball team, and when he's sent by Rita to hunt down zombies, he lies to her and tells her that none of the ones on the list were zombies. There's also another moment I found very poignant and that was when Rita and the Max Rager zombie doctor were asking Major about his last killing — the man in the park whose dog he kept. It seems that Rita and the doctor don't view zombies as being even remotely human. The doctor was surprised to hear that the last man killed was pleading for Major to not kill him or hurt his dog. They think of zombies as being the stereotypical ones often seen in things like The Walking Dead. Namely, unintelligible and with no trace of who they once were. I find that pretty hard to believe coming from Rita who's literally living with a zombie right now. You'd think she'd realize that zombies like Liv act just as human as she does. It doesn't really make sense. It's actually pretty incredible that Robert Buckley's made me feel all emotions in a single episode. He played the perfect mix of lighthearted and happy Major with Liv, while at the same time being conflicted and torn about his job as a zombie killer. I've repeatedly said that the cases in each episode are definitely not the highlights. And the main thing that keeps them interesting is Clive and Liv's interactions while on the case. This is another one of those times, which is why I'll focus on Clive in this review. We've had little to no background about Clive and his personal life, but we get to see a different side of him than we normally do in this episode. First, he confronts Liv about how odd it is that she's suddenly taken an interest in his Knicks mug (while under the influence of the basketball coach's brains), when just a few days ago, she had thought the cup stood for Knick Knacks. We're all anticipating when he's actually going to come out and propose his theory about why she acts like a different person during every case. I feel like it's getting closer to that point. Second, in a moment that I'm pretty sure had most people swelling with pride, Clive beats the abusive father of a boy, R. J., on the basketball team. "Don't ever put your hands on your son again." That wasn't all he did — he made sure to tell the boy's teacher to call him if they ever saw the boy with cuts or bruises. I'm wondering if this might tap into his history or if he's simply just a really great guy who cares about others. Either way, I think it's about time that the show gave us more backstory about him (and Ravi! I am always down for more Ravi). Another thing that was weighing heavily on Clive's mind throughout the episode was that he called Suzuki's widow and proposed the idea that he might have been suicidal. Let's just say that she didn't take it well, and he regretted it instantly. Clive is actually on the right track, however, because Suzuki did commit suicide. Understandably, though, Clive still felt horrible about what he said. By the end of the episode, Suzuki's widow's has forgiven him and drops by the office to give him something odd that she found in Suzuki's beer fridge. Which further pushes Clive (and Agent Dale Bozzio) into the zombie storyline and closer to solving the Meat Cute murders. Major and Liv are so cute. I didn't know I'd enjoy them so much, but the heart eyes Major has for Liv has completely won me over. Not to mention Liv caring so much about Major and checking to see if he's at risk of becoming a vampire. They really need to stop making the brains Liv cooks up look so delicious. I would eat them in a heartbeat. "What the hell, Lilywhite? It's 7:45 p.m. Are you 90?" — Liv to Major after catching him in bed. Clive completely beat that abusive dad. We rarely ever get a glimpse of Clive's personal life and this just barely taps into it. "Cavanaugh sent me this Vine, a cat walking on two legs." — Clive trying to hide his laughter. This joke just happened in the newest episode of Supergirl with Kara. I am literally Agent Dale Bozzio when she was trying to make Clive laugh by pretending to walk down imaginary stairs. Also, they're adorable. How is it that I can ship all the somewhat canon couples on this show? This has never happened before. Blaine singing "Friday, I'm in Love" by The Cure when picking up a sample of the zombie cure from Ravi is gold. And then when they actually play it during the fight. "Well, that's my cardio for the day." — Blaine after fighting Ravi.